Yesterday, I received a letter in the post (as it was called in the moving pictures) from one of my Senators, Senator Pat Toomey. 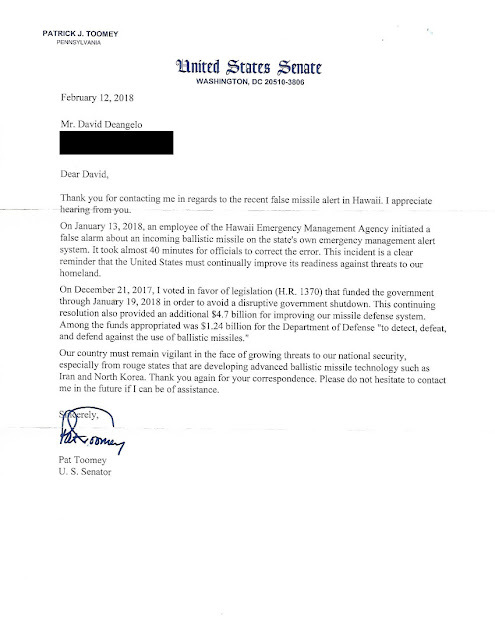 Thank you for contacting me in regards to the recent false missile alert in Hawaii. I appreciate hearing from you. A slight shift in the opening. I am used to seeing "Thank you for contacting me about" rather than "in regards to" but whatever. Let's go see to what letter he's referring. It's dated February 12, 2018. So we can safely assume it's not anything after that date. As far as I can tell, I've only once asked Senator Toomey about anything Hawaiian - here. A few days ago, Hawaii was rocked with a false ballistic missile alarm. For nearly 40 minutes the residents of Hawaii thought they were going to die a nuclear death. Hawaii, by the way, has a population of about 1.4 million. If only 10% were panicked, that's still 140,000 panicked US citizens. On January 13, 2018, an employee of the Hawaii Emergency Management Agency initiated a false alarm about an incoming ballistic missile on the state's own emergency management alert system. It took almost 40 minutes for officials to correct the error. This incident is a clear reminder that the United States must continually improve its readiness against threats to our homeland. So glad we settled that. On December 21, 2017, I voted in favor of legislation (H.R. 1370) that funded the government through January 19, 2018 in order to avoid a disruptive government shutdown. This continuing resolution also provided an additional $4.7 billion for improving our missile defense system. Among the funds appropriated was $1.24 billion for the Department of Defense "to detect, defeat, and defend against the use of ballistic missiles. Our country must remain vigilant in the face of growing threats to our national security, especially from rouge states that are developing advanced ballistic missile technology such as Iran and North Korea. Thank you again for your correspondence. Please do not hesitate to contact me in the future if I can be of assistance. Nothing, absolutely nothing about Donald Trump and his horrid non response the false alarm - which was the actual point of my question. Verdict: a response but not an answer. Another swing and a miss, Pat. BTW, I didn't typo in my Toomey transcript. He really does call Iran and North Korea "rouge" states. 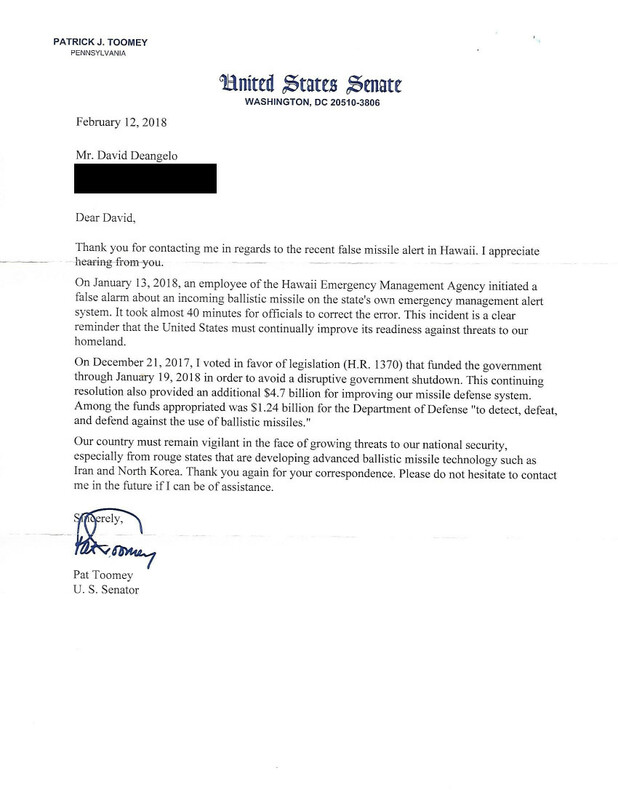 I wonder how many more of Toomey's constituents have written him about the Hawaii false alarm only to learn that North Korea is a rouge state?